Confidently evaluate evidence-based information to make timely and accurate diagnoses and treatment decisions! 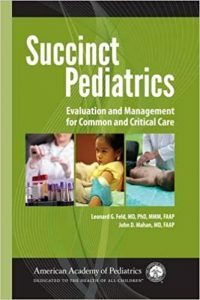 Starting with this volume, Succinct Pediatrics will be an ongoing series covering the entire scope of pediatric medicine. Each volume will include short chapters with key features and invaluable tables and algorithms, allowing health care professionals the opportunity to deliver the highest quality of care. The first volume features 72 topics with key points and detailed therapies. The book starts with an overview of the core knowledge needed for medical decision-making. Evidence-based levels of decision support are also provided throughout the book to provide insight into diagnostic tests and treatment modalities.